I'm wondering, On Mobile, when pressing a button (before releasing the finger), should the button grow or shrink? After the user lift his finger, the button returns to normal state. TL;DL: Both methods can work. 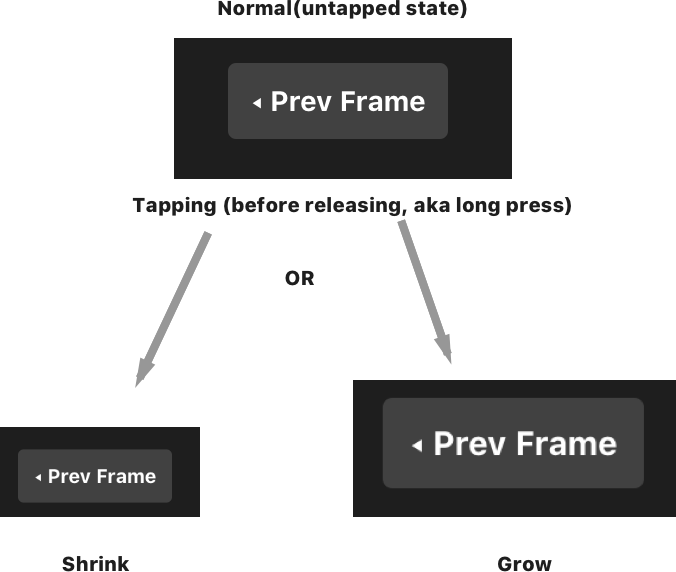 Shrinking is more logical but has less visibility because of the user's finger. Growing is not corresponding to expectations of real life but the interaction is better visible. Instinctically, I would always prefer a button to shrink, as you are pressing it down and that corresponds to the perception of the real world. The only problem that can arise with this is that the finger then covers the button and the user can not see what happens to it anymore. So the growing method has the advantage of better visibility. The Google Material Design Guidelines mention elevation and how it helps the user understand the order of the UI elements. I personally do not agree with that decision as it comes off as totally counter-intuitive. In the end, you can probably pull off both methods as long as you design them appealing and understandable enough. Always prefer Shrink because by shrinking button, we are showing user that it is pressed. so for showing pressed effect, we should shrink button, it's a good practice and It's good for Ux. For more information, you can check this link. Not the answer you're looking for? Browse other questions tagged mobile user-behavior user-expectation mobile-application usability-testing or ask your own question. Can the “Go”button on mobile devices' virtual keyboards replace an actual button on the interface? Should mobile navigation maintain state between pages? Where should I put (or should I use) a giant button?